When Mary Bell became the president of the Wisconsin teachers’ union in 2007, she didn’t envisage she’d be leading a grassroots battle against a government assault on public sector unions. 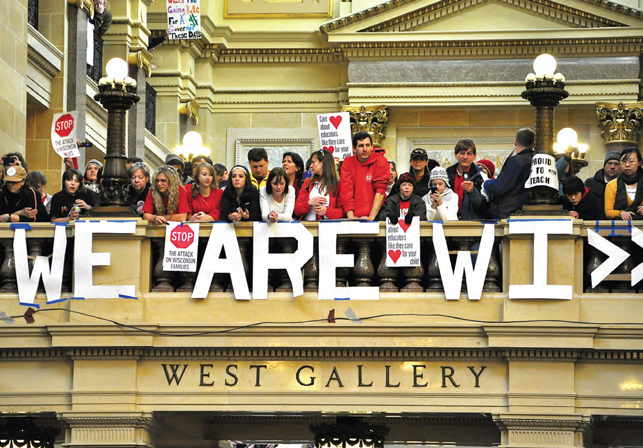 Wisconsin workers had some cause to be complacent about their bargaining rights. “We’ve had collective bargaining for public employees in Wisconsin for over 50 years. We had the first collective bargaining law in the States. No one expected that in four days they could wipe it out,” said Bell, referring to a series of initiatives imposed by the state government. ETFO invited Bell, an educator for 33 years, to address a November collective bargaining training session for locals. Public sector workers in Ontario haven’t experienced the same level of attack on their rights as their American counterparts, but we are facing a similar political climate, with government targeting public sector salaries and wages as the primary source of deficit reduction. Bell’s presentation to ETFO reinforced the importance of doing what we can as a union to avoid the politics of division south of the border. Wisconsin has joined a number of Republican- led state governments to cut expenditures and gut public sector contracts. In March 2011, the state passed legislation that restricts public sector unions from bargaining anything beyond salary, and mandates that salary increases cannot exceed inflation. Wisconsin teachers now also pay a greater cost of their benefits and have lost their 180 minutes of preparation time. In addition, the legislation requires the union’s 425 districts to hold recertification votes every year to maintain bargaining rights and to collect member dues directly rather than receiving them through the time-honoured dues check-off process administered by the employer. “I can now, as an employee of the public schools in my district, have my health club fees deducted from my salary, but I can’t have my union dues deducted,” Bell commented. These government initiatives “had nothing to do with balancing the budget; they were a direct attack on unions. And you need to be watching,” she cautioned. Wisconsin did not stop at attacking union contracts. “The elected officials in my state just got $1.6 billion out of public schools. At the same time, they gave just about as much in corporate tax breaks.” The state has also expanded the support for voucher education and funding for private schools in spite of the evidence that it is poor public policy. “We in Wisconsin have the longest-standing voucher program in the U.S. and for 20 years it has failed miserably because, guess what, educating poor kids is not easy,” said Bell. In December, Wisconsin Governor Scott Walker signed into law a bill that allows standardized test scores to be used to evaluate teachers and as a rationale to discipline or fire a teacher. The bill also enables school districts to opt out of the grades two and three class-size reduction program. In the face of anti-union measures, the Wisconsin teachers’ union, along with other state unions, turned its attention to mobilizing their members and reaching out to the community. “Workplace issues ... won’t get addressed without a contract or a union. Overall, we know that if our rights are threatened, the rights of working families and the open door to a better life for working families suffer as well,” said Bell. To connect to the community, the union created a campaign called “Speak Out for Wisconsin Schools.” The campaign involved meetings where teachers and community members were invited to speak about what contributes to quality teachers and how school districts can be accountable for education. The union created a video of parents’ testimonies and launched a Facebook page to promote broad public discussion. As the anti-union legislation worked its way through the legislature, union members and supporters staged mass protests. Rallies grew from 5,000 to 70,000 participants in less than a week. “The protests continued to grow beyond anything that had been seen even during the height of the Vietnam War,” said Bell. Every lunch hour, 50 to 125 people gathered in the Capitol rotunda to join hands and sing union songs. The bill passed the Republican-dominated legislature, but the rallies laid the groundwork for a petition campaign to force a recall vote for the governor. Organizers had to collect 540,208 signatures (25 per cent of the 2.2 million votes cast during the 2010 gubernatorial election) by January 17. On January 18, organizers announced they had surpassed the target by collecting more than 1 million signatures. In response, Republican Party officials have indicated they are going to court to seek proof the signatures are valid. It is just the next step in a protracted ground war. For ETFO, the goal is to avoid the Wisconsin scenario of having to fight to regain what is lost through budget cuts and the assault on collective bargaining and union rights. The Wisconsin experience underlines the importance of the work ETFO does to build connections and alliances with the broader community on an ongoing basis, not just when we reach a crisis. Contract negotiations are limited to salary. Salary increase can’t exceed inflation. Teachers lost 180 minutes of preparation time. Student test scores can now be used to evaluate, discipline, or fire a teacher. School districts can opt out of class-size reduction program. School districts no longer deduct union dues; dues must be collected by the union. Union’s local units must hold annual recertification votes to maintain bargaining rights. A $1.6 billion cut to education spending resulted in 1,655 fewer teachers, 765 fewer aides, and 776 fewer education support professionals.